Sherwood Equestrian: Sherwood Equestrian Supplies StormTrooper Boots. Sherwood Equestrian Supplies StormTrooper Boots. We recently received an interesting 'thank you' letter enclosing photographs of some riding boots purchased by one of our customers. 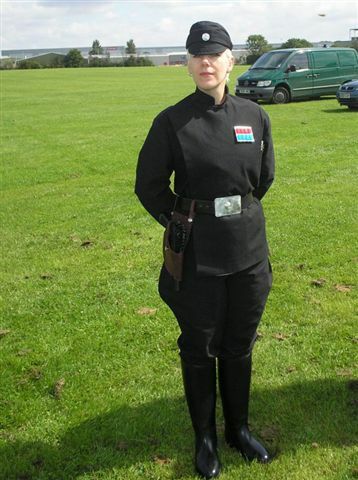 In her spare time, Samantha Jones is an Officer in the Imperial Army of Stormtroopers, part of the UK Garrison, which in turn, is part of a worldwide costuming group called the 501st Legion. Over 300 costumed members belong to the UK Garrison, appearing at various events around the country for a charitable donation. Primarily supporting Make a Wish Foundation and MediCinema, they also support local or small scale charity events to help boost their fundraising. 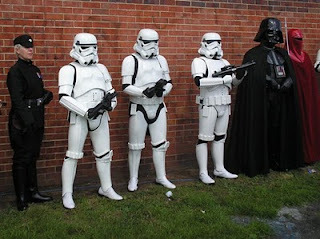 Samantha says that the Stormtroopers are often invited to help promote various media events such as film screenings and celebrity appearances. As a no-profit group, donations are put in their charity 'pot'. Lucasfilm has generously allowed the group to operate using the StarWars 'Intellectual Property' in order to raise funds for communities and charities, enabling the volunteers to enjoy their hobby to its full extent, whilst raising money for worthy causes. Their web site, www.ukgarrison.co.uk, has a lot more information.